An intensive investigation into composition and figure/ground relationships, and pictorial space. Unity of the parts as they relate to the entire page is emphasized over the rendering of individual forms. The expressive use of formal strategies and the relationship of form and content are also explored. Prerequisite: ART 112c and ART 112d. This class will use the human figure as a vehicle for narrative expression. 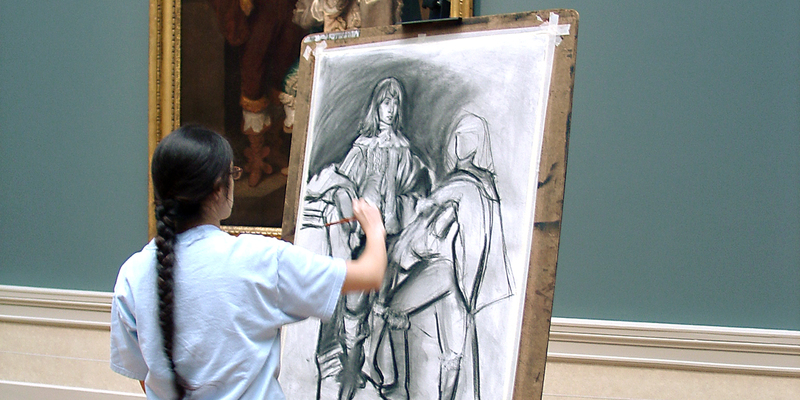 Resources will include the human model, self-portrait, historical models and one¹s imagination. Students will make compositions that place the figure into narrative situations. Figure studies and compositional drawings will be done in preparation for a series of large-scale works. Working in both wet and dry media, as well as basics of framing and presentation will be addressed. Students will be working from their own selections of forms and images, in a variety of scale and media. This class will include the exploration of implied movement; syntheses of multiple viewpoints; collage; and inventions based on historical models. Discussions of materials and techniques, as well as the professional presentation of drawings will also be covered. This class is a forum for the student to pursue an independent project, based on submitted proposals. Subject matter and media selections are determined by the student artist. The student is encouraged to develop a language of drawing specific to his or her needs. Large scale, and site-specific projects are also addressed. Prerequisite: ART 331a or ART 331b. Intensive study with emphasis on concept development and symbolization. Continued study with emphasis on various aspects of the medium.